WICKED tells the untold story of the Witches of Oz. Long before Dorothy dropped in, two other girls meet in the Land of Oz. One, born with emerald green skin, is smart, fiery and misunderstood. The other is beautiful, ambitious and very popular. WICKED tells the story of how these two unlikely friends grow to become the Wicked Witch of the West and Glinda the Good. Despite being labelled by some as a prequel to the Wizard of Oz, you will still be able to enjoy WICKED if you have not read or seen Wizard of Oz and not heard who is Dorothy. The story is easy to follow and some of the songs in this musical are very inspiring e.g. one of the lead character’s (Elphaba) rendition of “Defying Gravity”. The sets and props are also excellent – look out for the dragon on top of the stage – you will be surprised at what it can do during certain segments of the musical. If you have read/seen Wizard of Oz, you will be surprised by WICKED’s interesting version of how Scarecrow, Tin Woodman and Cowardly Lion came about and Dorothy’s “interesting” encounter with the Wicked Witch of the East. After watching WICKED the Musical, you will have a completely perspective of the original Wizard of Oz and might even sympathize with the Wicked Witch! Need more reasons to watch WICKED? There are lots more from the logical and coherent storyline development, plot twists, great singing from the cast to slapstick comedy (which are executed perfectly and necessary!). Just one more reason (if its applicable to you) – If your favorite color is Green, then you must watch WICKED the Musical! 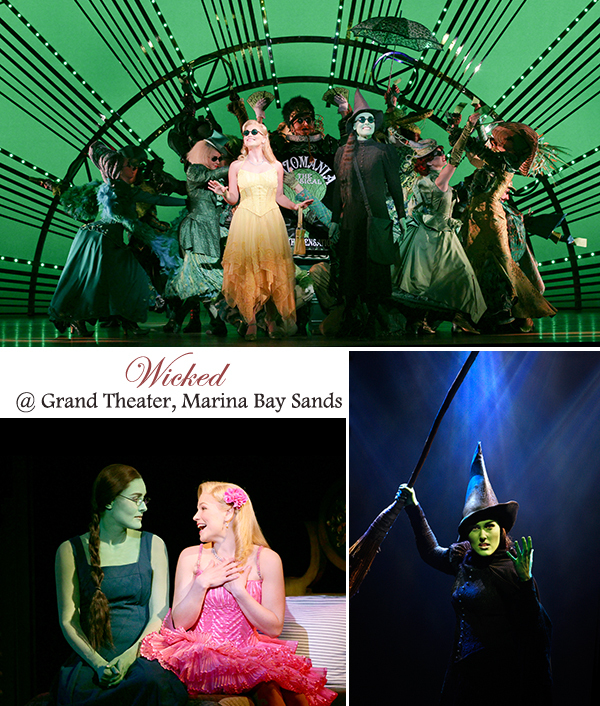 WICKED is now showing at Grand Theater, Marina Bay Sands for a strictly limited season so book your tickets before they run out. For bookings and more info, go to www.WickedTheMusical.com.sg. 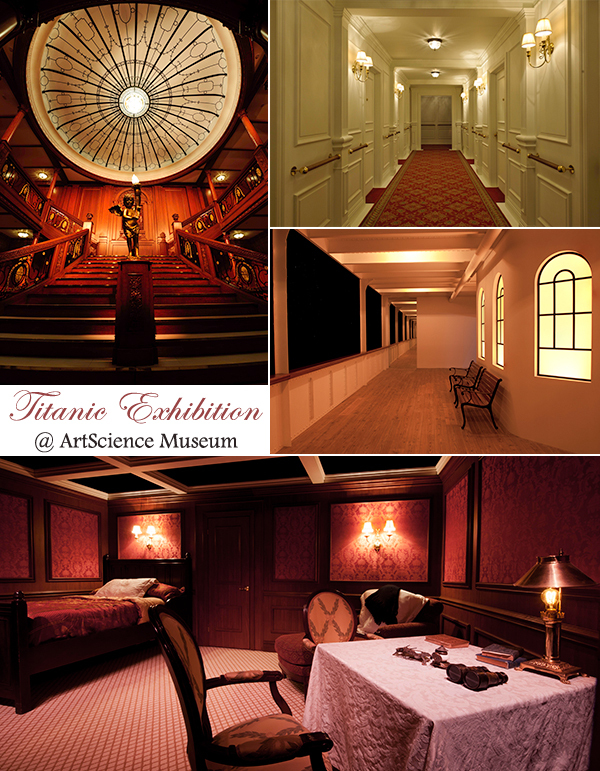 Travel almost 100 years back in time to experience the legend of the Titanic like never before. Titanic, the Artifact Exhibition features about 275 artifacts recovered – 14 of which have never been seen before – along with realistic re-creations and personal stories, each highlighting a different chapter in the compelling story of the Titanic’s maiden voyage. Be amazed at the detail in the extensive re-creations of First and Third Class Cabins, the Grand Staircase, Verandah Cafe, the Promenade Deck and Boiler Room. My favorite exhibit is the Promenade Deck which makes clever use of mirrors and lighting and sound effects to really give you the feeling of being onboard the deck of Titanic on a starry night. What impressed me is the experiential approach that the exhibitors had adopted for Titanic – you get to touch a real huge piece of ice so you can experience how cold was the night the Titanic sank. 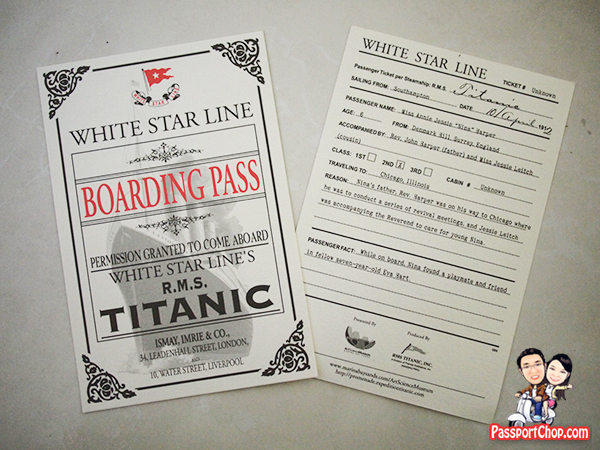 You are also given the opportunity to be immersed in the Titanic experience – each visitor is issued with a Boarding Pass on which tells the story of one of the passengers onboard the Titanic. Whether you are a first class or third class passenger, you get to see their living conditions onboard the Titanic. This exhibition then ended with a huge Memorial Wall which laid out the survivors of that fateful night as well as those who did not make it back. You can then find out what happened to the person on your Boarding Pass. It was as a result of the Titanic disaster that new international shipping law was drafted which thereafter required every merchant vessel on the world of more than 1,600 gross tons to carry at least one certificated Radio Officer competent to communicate by W/T and look after his ship’s radio equipment. Ships also had to carry a device called an “Auto Alarm” which kept watch automatically on 500 kiloherz which was designated the International distress bRadio Frequency. The auto alarm on every ship was activated if any ship sent out an SOS at any time of the day or night anywhere in the world on 500 Kiloherz.., So if an SOS was sent out all ships in medium frequency range of the distress position would be alerted either by a Radio Officer keeping his human watch on 500 kHz or if he was off duty, and even if he was asleep in his bunk during the night, he would be alerted by a very loud bell in his cabin and race to the radio room to do his job. Oh nice with lots of options from which we can learn many things. Never heard of that story but it sounds cool. I always love “spin-off” stories, they give a sense of continuity and fullness to the existing storyline.